The Big One turned 20 this past week and we celebrated on Friday. She invited the boyfriend and the best friend to join in the festivities. We decided to do dinner at home and, don’t faint , she chose SALMON. If you don’t know the story behind the salmon, you can get up to speed on my post A Conversion Experience. She left the cake choice up to me, and I decided to add in a little first course that I had been dying to try (more on that in a bit). 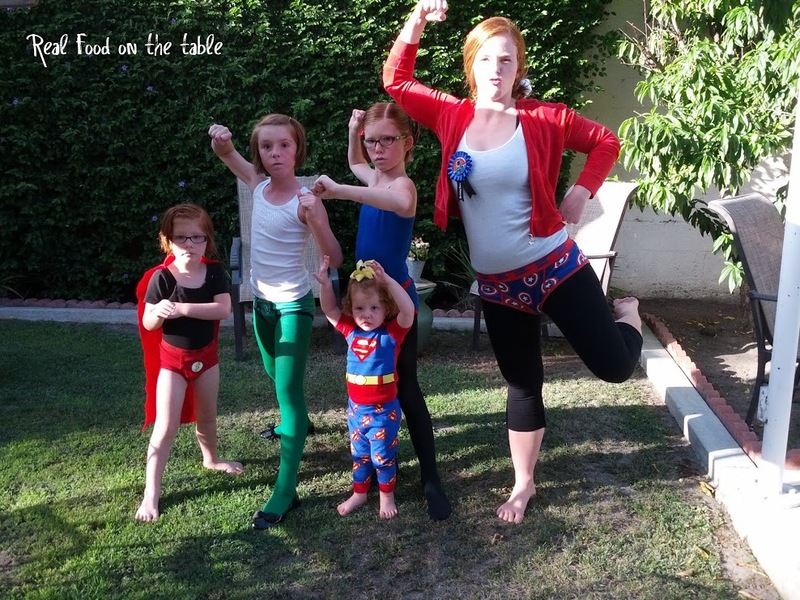 Big One and I decided on a Super Hero theme together, and we also thought it would be fun to do a video scavenger hunt. Then she was kicked out of the planning process because we all know there’s nothing sweeter in life than a good dose of surprise. The sisters got to work on costumes for the event. I decided that we could kill many super hero stones with the purchase of one 5-pack of Justice League boys’ undies. We ended up with a Super Man, a Green Lantern, and a Flash. The Wee One even got her own Super Man outfit. Last up in the party preparations were decorations. 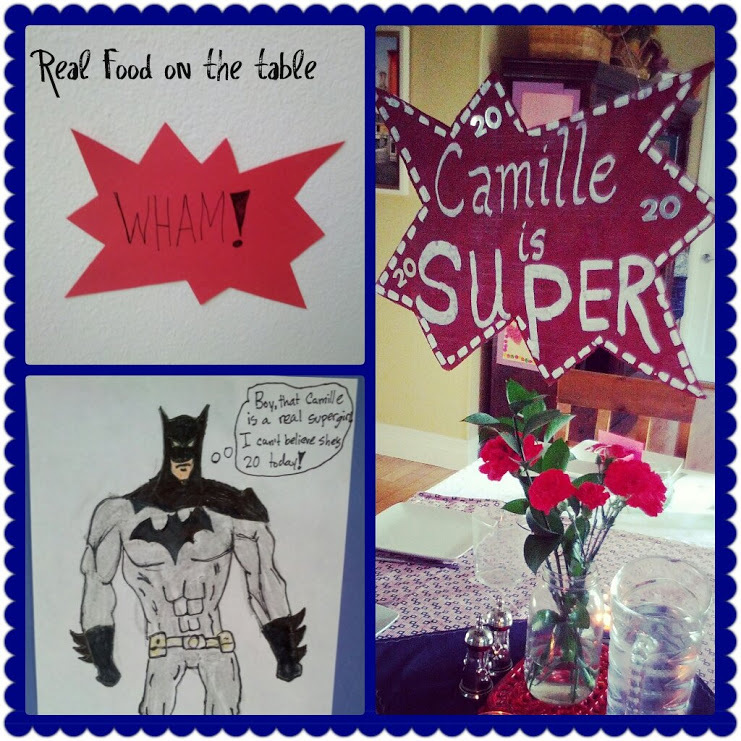 The sisters had fun with super hero drawings, signs, and various other decorative doo-dads. When the evening of the party finally arrived, dinner was devoured in what seemed like seconds. I would like to think it was that the food was fab, but the real reason was more likely that everyone couldn’t wait for the main event of the evening -the video scavenger hunt – to begin. We broke into 2 teams of 3 and off they went. In an hour, they were back. We plugged the cameras into the TV and watched some hysterical footage and listened to stories that I’m sure will become family lore. The best one being that the Hubs got the chief of the fire station to announce over the PA a call to all men on duty to report to the front of the firehouse, up went the huge roll up door to the station, and then as 7 fireman looked on, the Hubs and his fireman companion proceeded to Stop, Drop & Roll in style! We feasted on birthday cake. 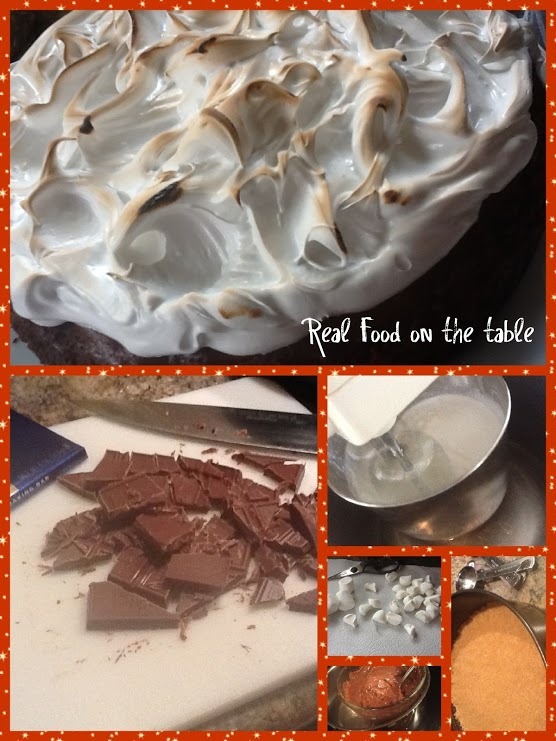 The kids all loved it, but I can’t say it’s one I would make again. A S’More Cheesecake. I’ll opt for real s’mores around a camp fire any day. Big One’s boyfriend is editing up all of the video footage. Maybe sometime soon, I’ll be able to post a link to our evening of craziness. Until then, I’ll have to just share with you my secret foodie highpoint of the event. Remember . . . that little first course I mentioned earlier? Meet Fig & Prosciutto Salad. Let’s just say I made it again today I am so in love with it. It screams summer, is super simple, and beautiful to boot. The dressing consists of just olive oil, honey, and a little lemon juice (I used lime juice since I didn’t have a lemon on hand. Toss it all in a jar and shake well. Quarter you figs without cutting all the way through and place them on your platter. 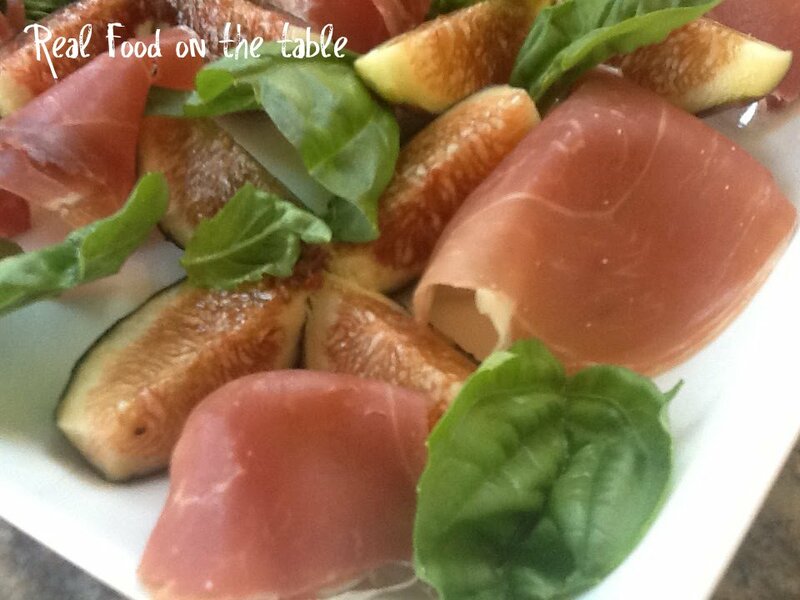 Tear pieces of prosciutto and scatter around the figs. Then add in some fresh basil leaves. Drizzle the dressing over and serve. I guarantee you’ll hesitate before digging in. It’s so simply beautiful that it demands admiration before consumption. 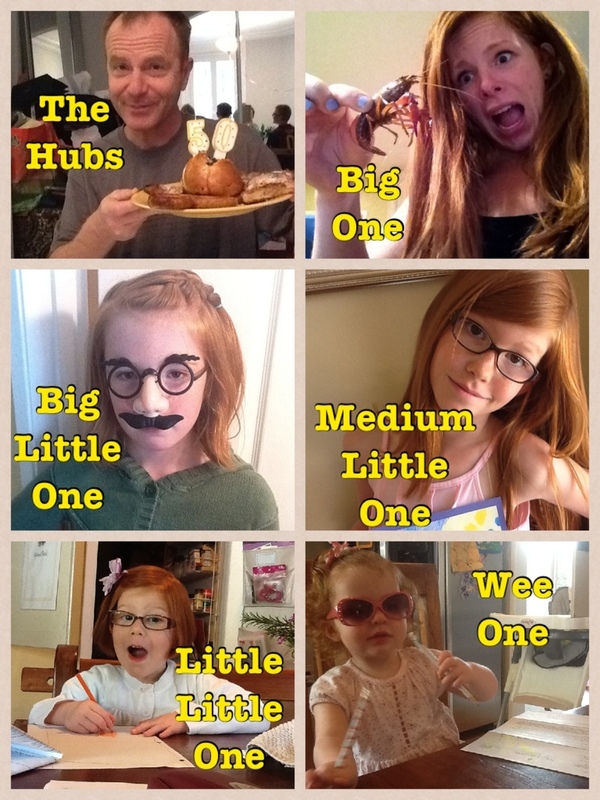 So Happy Birthday to the Big One! I loved every moment of the celebration and my new personal summer hero is the fig one. 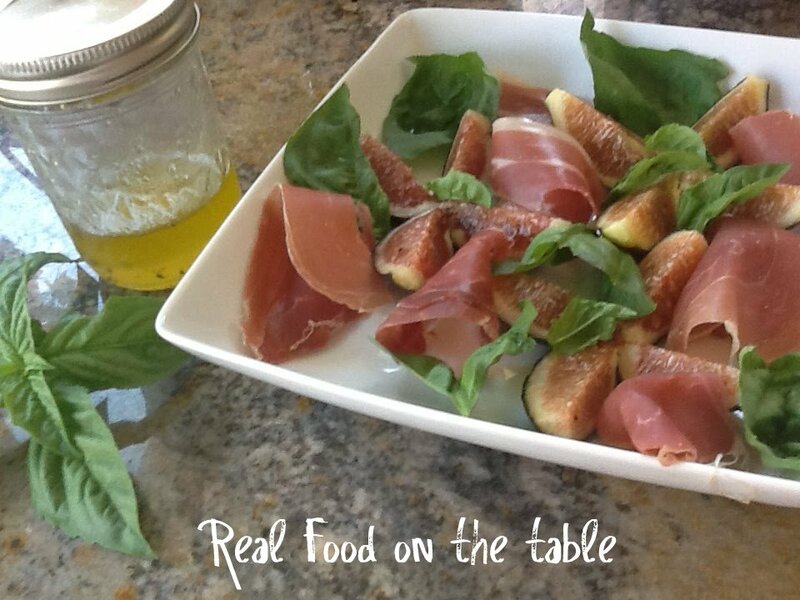 Here’s the full Fig & Prosciutto Salad Recipe which I adapted from Simple Provisions.